破竹の勢いを見せるDJ NOBUをはじめCHIDA、ELLI ARAKAWA、The SAMOS -Live-、Fake Eyes Production (Shigeo JD+Mustache X)などSOFTMACHINEを愛する著名DJが一堂に会するスペシャルナイト!! 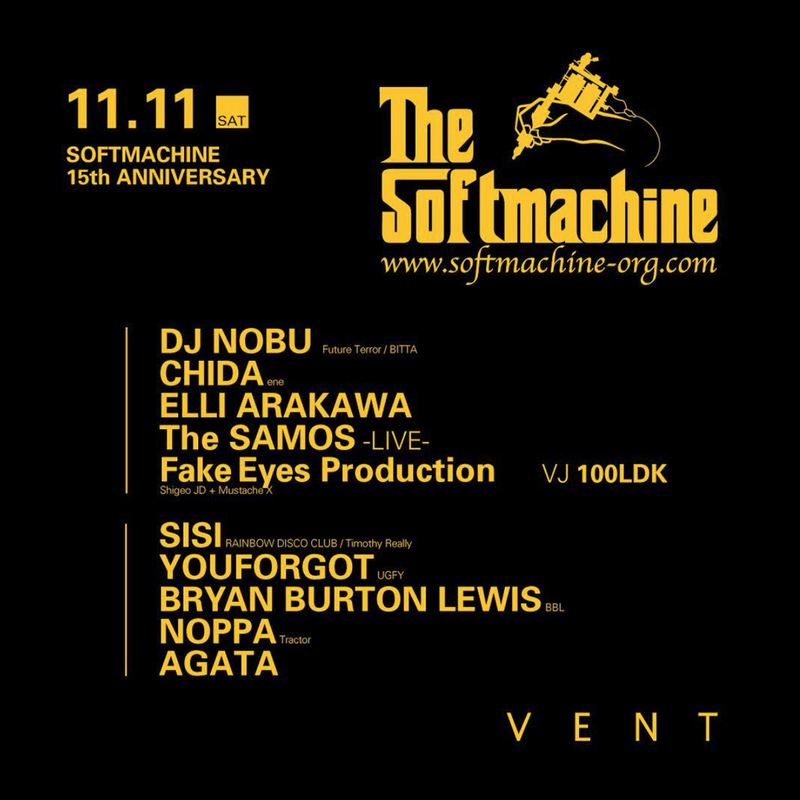 Apparel brand SOFTMACHINE celebrates the 15th anniversary with intimate artists!! Having tattoo culture as its backbone, Kosuke Yamagishi launched apparel brand ” SOFTMACHINE ” FOR SERIOUS INK MANIA in 2002. This year it will have its 15th-anniversary party at VENT on November 11th. Joining TATTOO CONVENTION every year as the Japan-based apparel brand, SOFTMACHINE always capture tattoo culture from various angles. Its production with uniqueness is always supported by customers. For this very special night, we will have DJ Nobu who hails around the world with irresistible force, CHIDA, ELLI ARAKAWA, The SAMOS -Live-, and last but not least Fake Eyes Production (Shigeo JD+Mustache X). With all the DJs SOFTMACHINE loves, the night will be carved in your brain like a TATTOO!